I purchased during one of the Sephora VIB sales so I could get a few dollars off and feel a little better about the purchase price. I had heard a YouTuber mention how great it was so I went for it. One day I’m going to do a post titled ‘YouTube made me buy it’. A week or so ago I went to Seattle and San Francisco and decided this was my choice of body cream. I had started using it before my trip and was questioning it a bit. Taking it with me gave me over two weeks to test it out every single day and see just how good it was. Let me give you the backstory. One morning after getting out the shower I applied the body cream all over and I really liked the way it smelled. I even went to work and received many compliments on it. Almost had me thinking what do I normally smell like. After work I was on the elevator with this guy and I smelled this odor that came across as food. I questioned if I left food in my tote bag and hope that the guy in the elevator didn’t smell it. When I got inside my place and opened my bag there was no food. Next day same routine and now on my ride home I smell food again. Hmmm why do I keep smelling food? I am getting ready to take a shower that evening and I smell it again…it’s my body cream I’ve been wearing the past 2 days. So at this point I’m thinking the amount of money I have spent on this body cream how could it have me out here smelling like food. This is where I decided I was taking it on vacation with me. While in Seattle I explained to my friend Heather about this body cream and how I thought I smelled like glazed ham. Of course she laughed at me and said she didn’t smell ham but whatever I had on smelled good. I was determined at this point to continue to use it and I just knew at some point she would agree…she never did. I went to San Francisco and a lady was standing next to me during the Super Bowl party and commented that I smelled really good. I even received additional compliments from other friends who knew nothing about how I felt about this body cream. It seemed that I was the crazy one. I continued to use this body cream and told myself to really think about what I was smelling. I went back to the label of the body cream, Almond Coconut Soufflé and that was just it. I smelled like toasted almonds and coconuts not glazed ham. I don’t know how I came up with glazed ham but I was so wrong. Whewww!!! I was really starting to get worried but I can say that this body cream is amazing. It leaves your skin feeling soft all day without a greasy feeling and a little goes a long way. No perfume is needed when you use this, it’s a 2 in 1 deal!!! 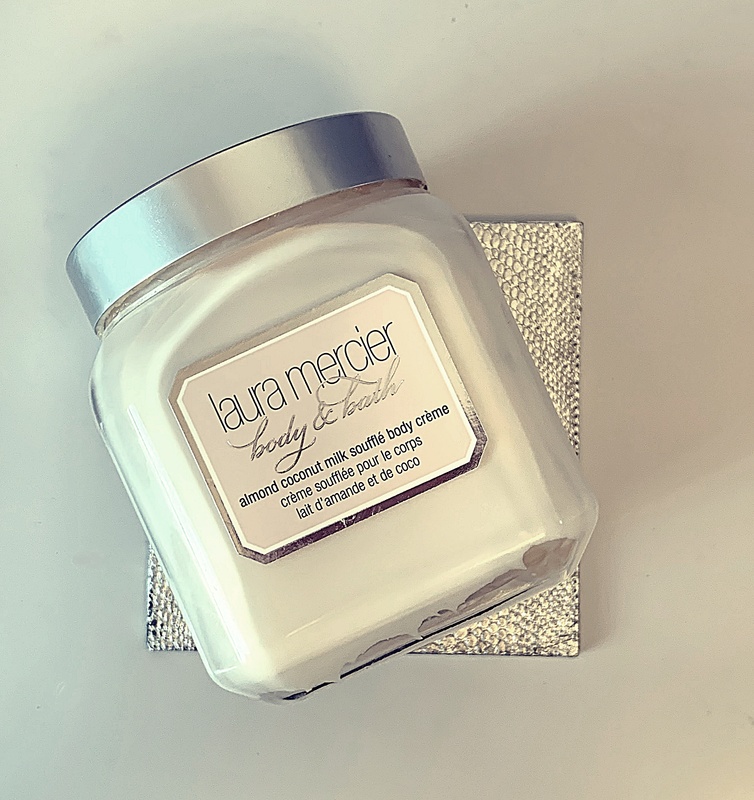 This Laura Mercier body cream is perfect for the winter months. It will leave your skin moisturized all day until you shower at night. I am sure that I have been putting on way too much but I won’t make that mistake when I purchase my next jar. Of course I’ll be waiting on the next Sephora VIB sale to do so. Do you have any body creams that you have used lately and can’t get enough of?